Expertly preserve email evidence without breaking a sweat. Get plug & play output for digital forensic investigations and eDiscovery. This small Gmail and Google Calendar collection takes place in about a minute—complete with logs, hashing, and simultaneous output in EML, MSG and PST formats. That’s faster than the time it takes to launch some software! 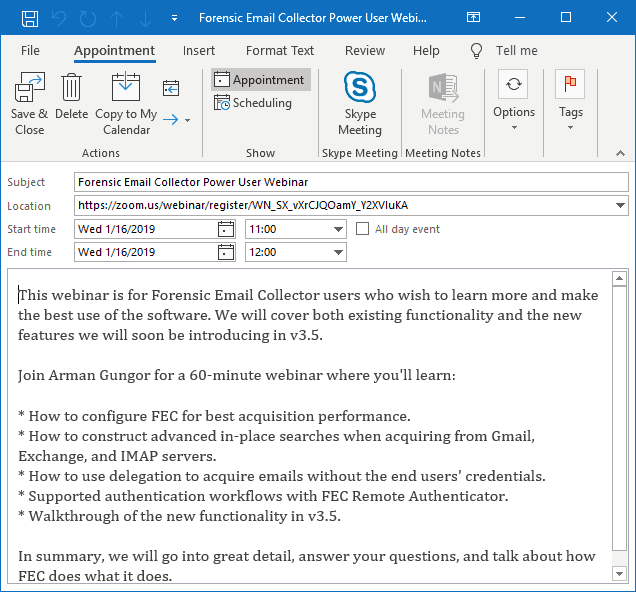 Forensic Email Collector can connect to most popular email servers and cloud email providers. You are not stuck with IMAP or POP for forensic email preservation. FEC can connect to Exchange servers—including Office 365—via Exchange Web Services. You can preserve emails faster and more accurately, and without having to configure the target Exchange server for IMAP access. FEC authenticates with Gmail and G Suite using OAuth and forensically acquires mailboxes at eye-watering speeds via Gmail API. Say goodbye to downloading the same message multiple times because of overlapping labels. FEC connects to IMAP servers in a read-only manner and preserves email evidence without modifying the target mailbox. Outlook.com, Hotmail, Yahoo Mail, Zoho, iCloud and AOL Mail are just a few supported providers. Exchange, Office 365, Exchange Web Services, EWS, Gmail and G Suite are trademarks or registered trademarks of their respective holders. Use of them does not imply any affiliation with or endorsement by them. We all run into cases where collecting a mailbox as a whole is not an option—often due to privacy or timeframe concerns. On the other hand, eDiscovery and digital forensics workflows often involve a full collection, followed by post-acquisition searches. Forensic Email Collector solves this problem in a creative way by allowing examiners to search mailboxes on the server side prior to the acquisition and download only the search results. No need to create labels, tag documents, or make any changes to the target mailbox. 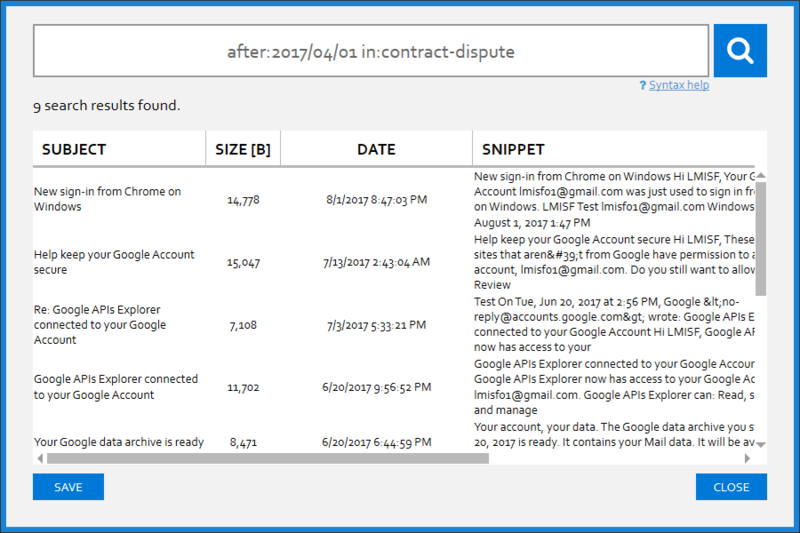 Instantly search Gmail / G Suite, Office 365 / Exchange, and IMAP mailboxes before the acquisition. Did an acquisition get interrupted? No problem; we can resume a past project when you are ready. Detailed acquisition and exception reports so that you can record and document exactly what happened, when and why. FEC can automatically retry acquisition as many times as you want. You don’t have to go back to square one because of a pesky server or due to network issues. You can connect to Gmail using OAuth 2.0 instead of using credentials. No need to enable “access for less secure apps”. FEC can output to EML, MSG or PST format. You can export to all three simultaneously—complete with MD5, SHA1 or SHA256 hashing of the output. As soon as you start an acquisition, Forensic Email Collector captures snapshots of each mail folder. 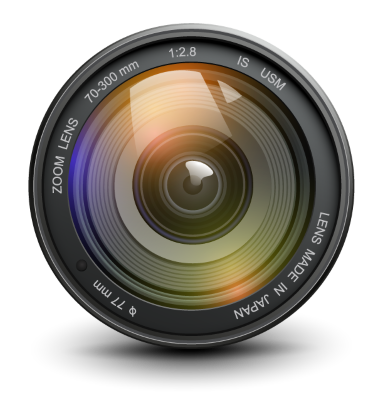 The snapshots are used to keep track of which mail folders and messages have been downloaded. If you run into a network error or if the server throws a fit—free email providers are notorious for throttling large scale downloads—FEC automatically retries remaining messages as many times as you want, calculating an optimal delay amount between each retry session. Mailbox snapshots are persisted in a database. So, you can even stop the acquisition and resume it later by loading a past project. Forensic Email Collector doesn’t stop at emails. You can also forensically acquire events from Google Calendars and appointments, contacts, and notes from Exchange servers. Just like emails, these items can be exported in MSG and PST formats in addition to generic formats such as iCalendar (.ics) and vCard (.vcf) depending on item type. Many great organizations from law enforcement agencies to corporations, legal service providers, and top law firms trust Forensic Email Collector to forensically preserve emails. We have added a few features to FEC to make sure it is a joy to use. When preserving email evidence from an Exchange server, you may not immediately know the Exchange Web Services (EWS) endpoint URL. FEC utilizes the Exchange Autodiscover service to automatically configure itself using the target email address and password. FEC includes built-in connection profiles—including host name, protocol, port and SSL settings—for hundreds of popular domain names used by email service providers such as Gmail, Yahoo, Outlook.com and iCloud. If the target email address matches one of the profiles, server settings are populated automatically for you. As soon as you type the target email address, FEC checks the domain name to see if it fits one of the pre-configured profiles such as Gmail, Outlook.com, Yahoo, etc. If it does not, it looks up the mail exchanger records (MX records) to determine the mail servers handling email messaging for the target user’s domain. When you use the IMAP protocol, FEC keeps a detailed log of IMAP communications with the server in addition to its standard acquisition and exception logs. You can do a play-by-play of what FEC asked the server and how the server responded if that’s your thing. As soon as we receive your order, we will email you an electronic download link and your license key.